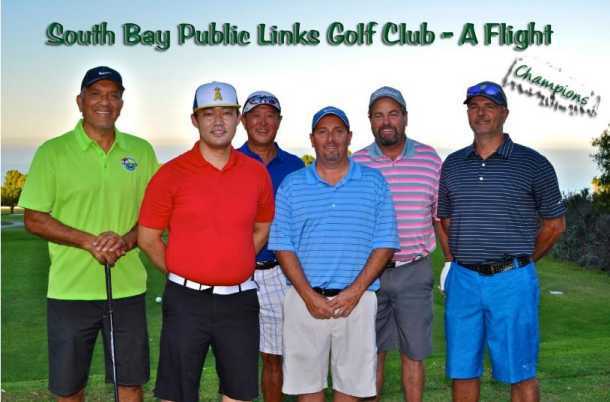 ith a group of friends we've organized a club called the South Bay Public Links Golf Club, with our home course at Los Verdes golf course in Rancho Palos Verdes. We would appreciate it if you take a few minutes to review the information in this web site about this exciting club. It costs only $42 to join and we are currently accepting new members. As you probably know, Los Verdes is a beautiful course overlooking the Pacific Ocean and is one of the hardest public courses to get a tee time. Following a long planning period, we have been able to secure good starting times for several annual tournaments at Los Verdes. We will also have a few events at other local courses each year. We are open to golfers of all abilities, including men, women and juniors (who may join for free). This is a great opportunity even if you only want to play Los Verdes once or twice a year. 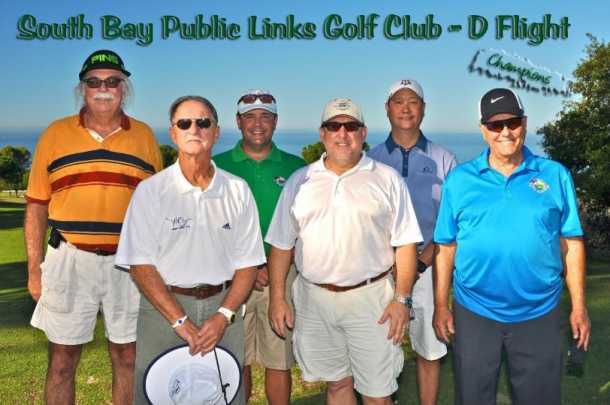 If you don't have an established handicap and want to start one, joining our club is an inexpensive way to do so, even if you don't want to play in the club events. We are looking forward to new members participating in this exciting club. Click here to join SBPLGC online as a new member. Click here to renew SBPLGC membership online. Click here to join SBPLGC by mailing membership form. 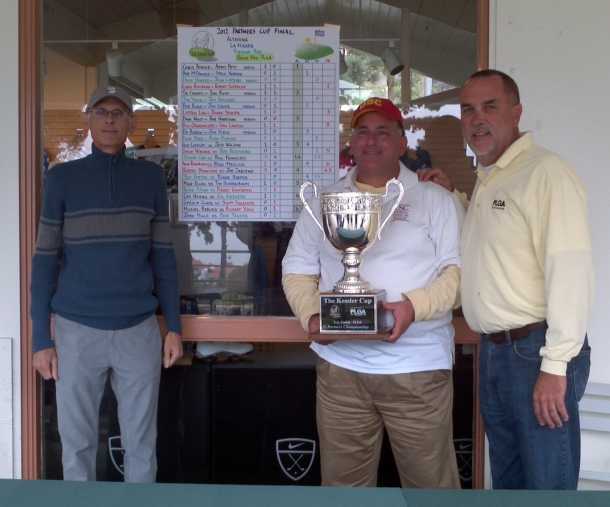 SBPLGC member Byrant Millan won the Overall Low Net in the Los Angeles County Champion of Champions Tournament! 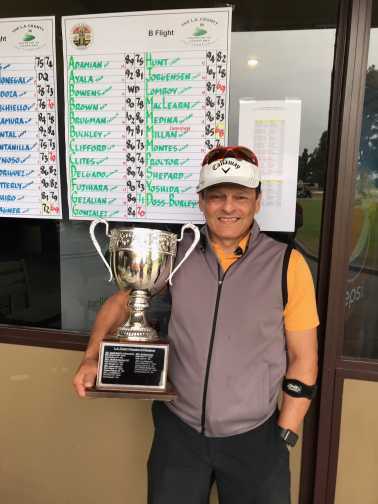 SBPLGC member Steve Shepard shot a net 69 and came in the money in the SCGA Tournament of Champions (Net Division) on December 3, 2018 at Cimarron Golf Resort! Pictured with Steve is Bryant Millan another of our Net Club Champions who proudly represented the club in the same event. SBPLGC Captures the LA County 2017 Partner's Cup Championship at Mountain Meadows GC! 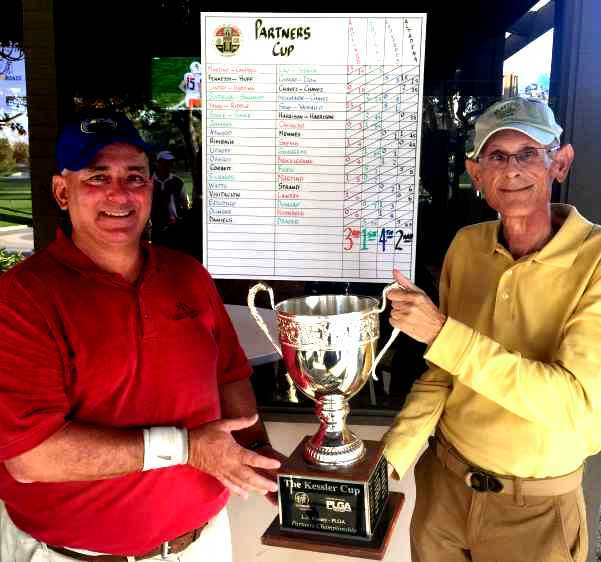 SBPLGC President Lew Murez accepts the Kessler Cup from Craig Kessler. 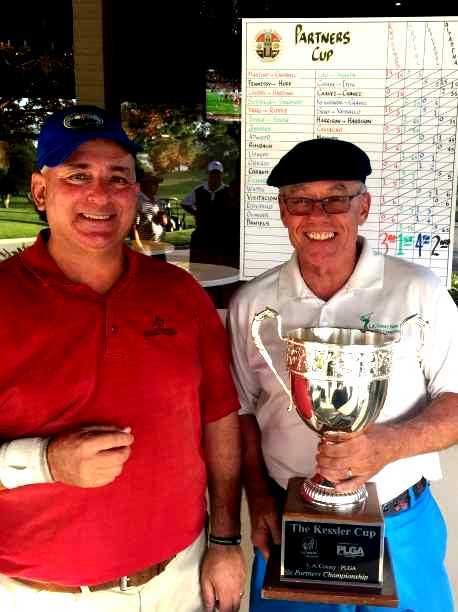 SBPLGC President Lew Murez and Kevin Draper with the Kessler Cup. A key chip in by Kevin draper in the final match on hole #17 clinched the Partner's Cup victory, by one point over Altadena. Great to get the cup back! SBPLGC Captures the LA County 2016 Team Play A, B and E Flight Championships! 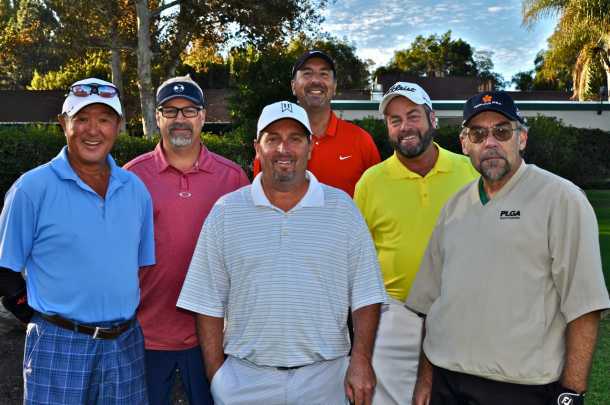 SBPLGC had another tremendous day in the finals of LA County Team Play Championship matches, held at Diamond Bar GC on Octiber 9th, capturing the A Flight, B Flight and D Flight Championships. Congratulations to the 2016 Club Champions! It took two full days of sun-up to sundown match play in order to crown the 2015 SCGA One-Day Player of the Year. 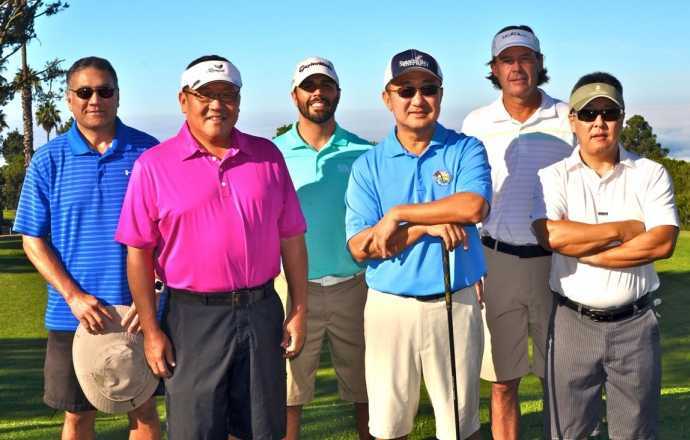 David Fujii was able to survive a grueling 72-hole format in the inaugural One-Day Series Match Play Championship held at PGA WEST in La Quinta. 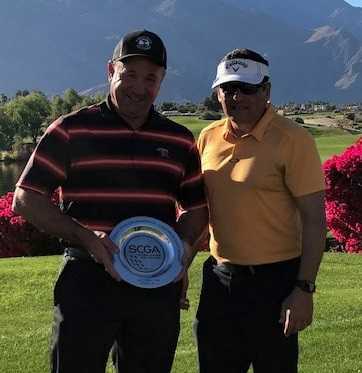 The SCGA One-Day Tournament Series, one of the SCGA's fastest growing programs,hosted its first ever Match Play Championship this weekend at PGA WEST. The top 16 players from the year-long points list, which distributed points to participants from the series' 23 2015 events, made the match play championship and had the opportunity to compete for this year's SCGA One-Day Tournament Player of the Year honor. Fujii outlasted year-long points leader Spencer Sam in the championship match, taking a 1-up victory. After Fujii jumped out to a commanding 6-up lead through 10, Sam battled back to take the next four holes and capped the gutsy comeback with a birdie on the par-3 17th. “Spencer played incredibly down the stretch,” said a relieved Fujii. “I thought I was in trouble with the way he was swinging.” Standing in the dusk on the 18th tee, Sam pulled a drive into the water while Fujii found a fairway bunker, but dumped his second shot into the drink as well. With darkness fully upon the players, Fujii was able to get up and down to seal the championship. “I was striking my short irons terrific today,” said Fujii. “Combine that with a hot putter and things were going well.” Fujii’s journey through this Match Play Championship was taxing to say the least. On Friday, he defeated Edward Ornelas 4 & 3 and topped Nick Parisi 2 & 1 before earning a berth in the championship via withdrawal. Along with Player of the Year honors came a few extra perks. Fujii was awarded a $500 Golfsmith Gift Card and a framed One-Day Series flag. A part of our club mission is to support junior golf and the golfing enjoyment of everyone. 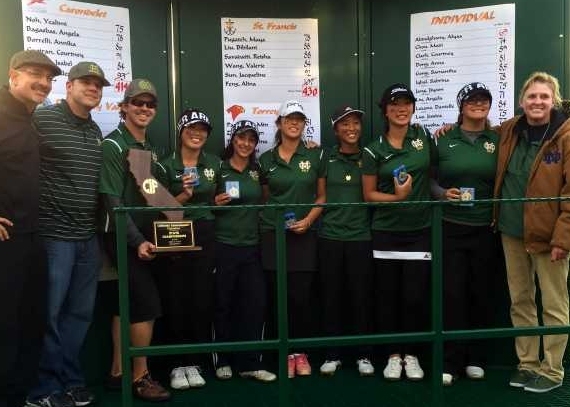 To that end, you might enjoy hearing that one of our original juniors, Marni Murez, along with other SBPLGC junior members Veronica Chen and Danielle Richman, led the Mira Costa High girls golf team to a California State Championship at Poppy Hills on Tuesday. Many of you are aware of the countless hours that Lew puts into making the Club as great as it is. 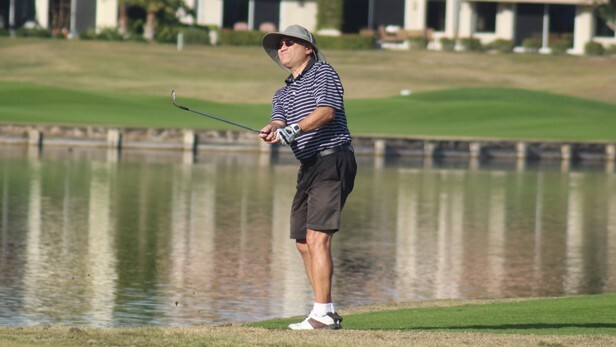 What you may not be aware of is the time he puts into fundraising efforts and support of junior golf in general, and the girls golf program at Mira Costa in particular. Congratulations to Marni and her team mates Andrea Lee, Ashley Kim, Lexi Nielsen, Veronica Chen and Danielle Richman who were the 6 finals players and to Head Coach Tom Cox and their entire family on this great golf accomplishment for the entire South Bay area. This was the area's first appearance in the State Championship since Torrance HS last won the title in 2009. This was a very special group of Mira Costa seniors and all four seniors who played on Tuesday will be moving on to college golf: Andrea (Stanford), Marni (Boston College), Danielle (Fresno St) and Veronica (still TBD). 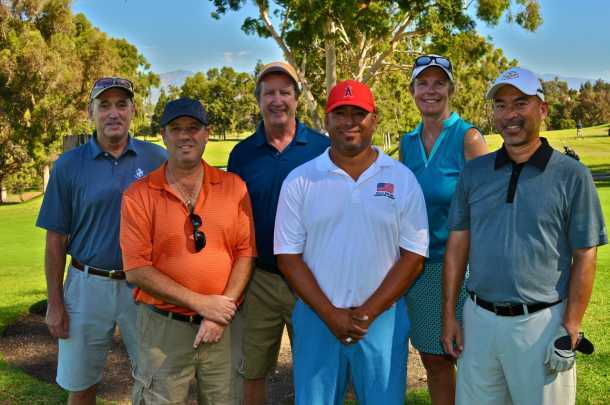 SBPLGC Captures the LA County 2015 Team Play A Flight and D Flight Championships! 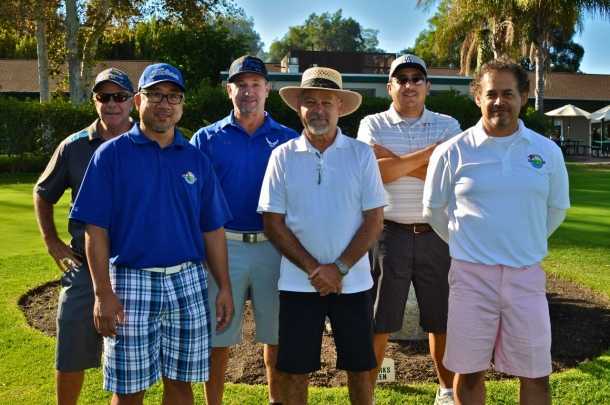 SBPLGC had another tremendous day in the finals of LA County Team Play Championship matches, held at Los Verdes GC Octiber 10th, capturing the A Flight and D Flight Championships. Congratulations to the 2015 Club Champions! SBPLGC Captures the LA County 2014 Team Play - Championship, C Flight and D Flight Championships! 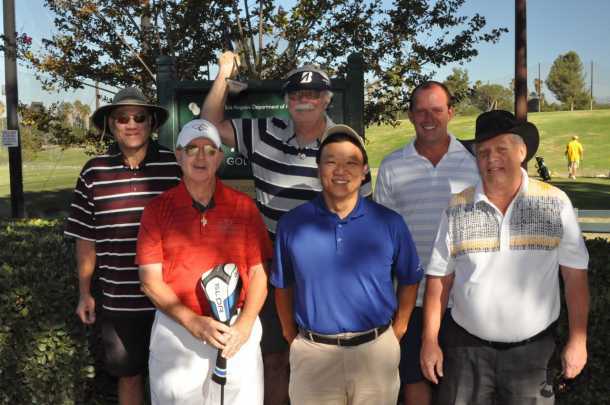 SBPLGC had a tremendous day in the finals of LA County Team Play, held at Los Verdes October 5, 2014, due to LV being the 2013 LA County course of the year. We fielded teams in all 6 flights, and 4 of these teams made it to the finals in this single elimination format. Out of our 4 teams in the finals, we claimed 3 titles, which will be represented by engraved crystal perpetual trophies that we will receive to display over the next year. No other club won more than one title. First, our championship flight team knocked off 2-time defending champion Brookside 11-7 in a thrilling and very close match. This was our first ever win in the Championship Flight after a number of close finals losses over the years, so this was especially sweet. Next, our B flight team was locked in a close match with Lakewood which we took down to the final hole of the final match, but barely lost 8-10. Then, a similar situation in C flight it came down to the final hole and the match wound up deadlocked at 9-9 vs. Eaton Canyon. We sent captain Richard Yoon and Tom Ciccarone out into a playoff and Richard made a clutch downhill birdie putt on the fist hole to win the title. Finally, a repeat of this situation again in the D flight with a 9-9 tie vs. La Mirada coming down to the final hole. Buddies Roger Dunlap and Anthony Xanthis who played in the anchor match went back out for the playoff and won it in thrilling fashion on the first hole. Anthony hit a tremendous pitch from the rough on the hillside right of #1 green to short range and with others in trouble was able to cozy it up for a conceded par to win the playoff. There is nothing like the thrill and excitement of team match play and this is one of the events that is like the Ryder Cup for us! If you like this kind of competition and have not before played on one of our teams, we have other opportunities throughout the year so watch the emails for announcements. Next up will be SCGA team play which starts in late January. 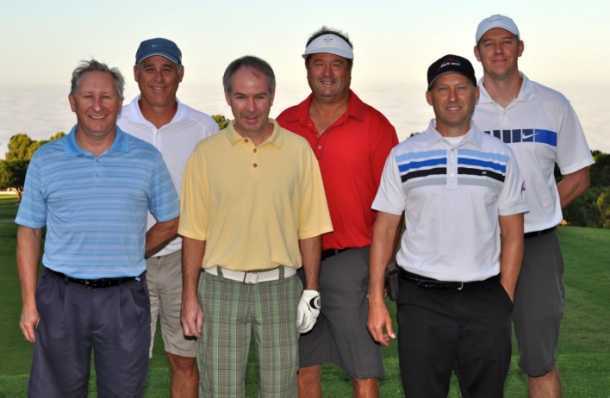 SBPLGC Captures the SCGA 2013 Team Play - C Flight and E Flight Championships! 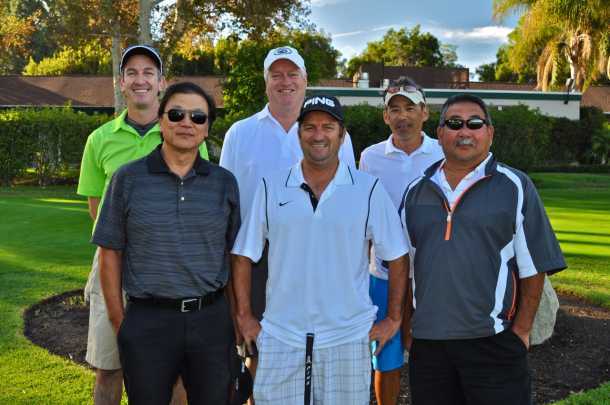 The LA County Team Play wrapped up on September 30th at La Mirada Golf Course. This year, we had the largest ever participation by our membership as we fielded teams in all six flights. Thank you all for getting behind this very special team/match play event. Team events are really special as they create lasting bonds among our members and fosters camaraderie with other clubs. We sent three teams in flights A, C and E to the finals and came back with two titles in C and E flights! The A flight played really well and lost a very close match. The C and E teams won in dominating fashions with respective scores of 16-2 and 15-3. The E team was a repeat winner having won the title last year. No other club won more titles than we did this year! 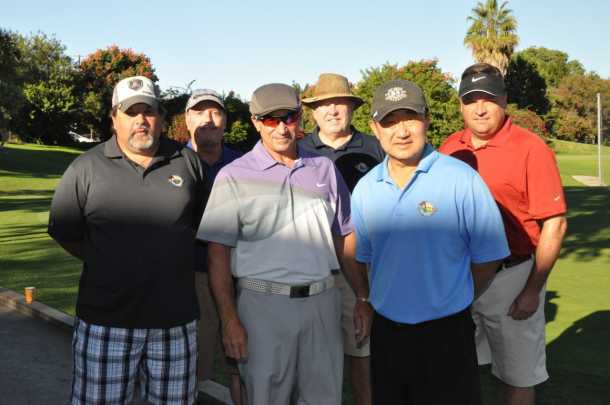 A Flight Final Match Players - Duane Yoshida, Robert Dennison, Bill Uphoff, Bill Fennessey, Joe Zarceno, Lippen Lau. 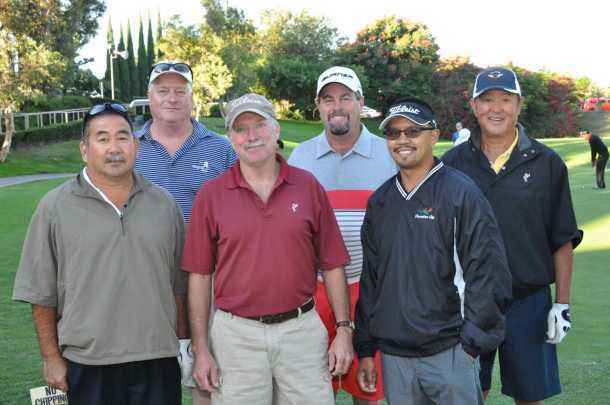 C Flight Final Match Players - David Fujii, Stan Faris, Brian Campbell, Scott Sakamoto, Antony Pitt, Bob Wray. 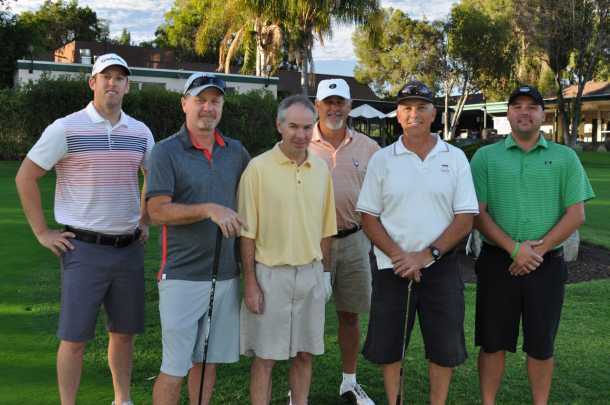 E Flight Final Match Players - Randy Sgro, Ken Landau, Steve Shepard, Bob Plavchak, Richard Yoon, Marc Berget. On Saturday, November 17th at Los Verdes GC the SBPLGC won the 2012 Los Angeles Partners Cup Championship, marking the 3rd consecutive win. 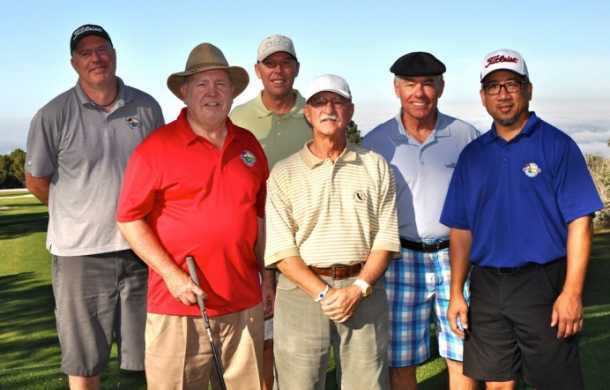 This event is contested annually across 4 regions among 20-25 golf clubs with home courses in the Los Angeles County area. The SBPLGC team scored points in 8 of 9 matches. 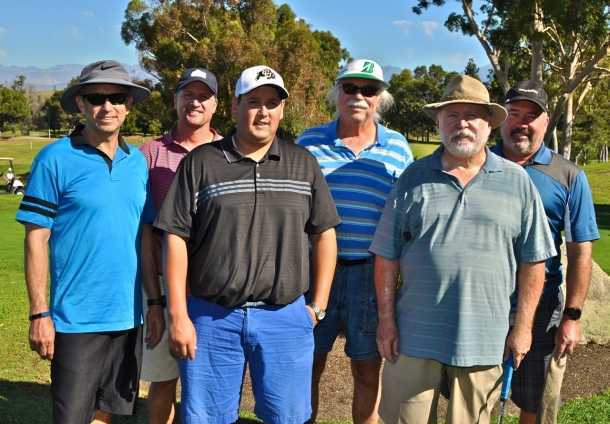 The first match was won with Club Director Chris Rossberg holing a dramatic bunker shot on the 18th green, for a Rossberg-Suppelsa team win in the alternate ball back nine segment. The team never led wire-to-wire. 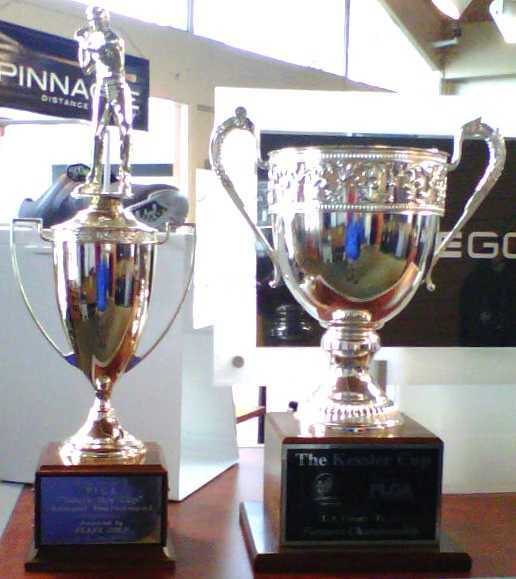 The SBPLGC used 24 players over the course of the regional South Bay Cup and the LA Partners Cup finals. Congratulations to all of the players in this exciting event. SBPLGC President Lew Murez receiving "The Kessler Cup" from SCGA Governmental Affairs Director Craig Kessler. SCGA Director Craig Kessler, SBPLGC President Lew Murez and LA County Golf Director Mike McMonegal. The SBPLGC won the 2012 Sout Bay Cup for the 4th consecutive year by a narrow margin, as it came down to the last few matches. We had a great mix of veteran player from prior years and a number of first time players.